Arid Sands and its hub town Shamar form the sixth area visited in Sonic Unleashed. Based on a Middle-Eastern desert town, Arid Sands features many breakable objects, ruins, and a great deal of Wall Jumping. The day stage ends outside of a structure resembling the monastery at Petra in Jordan; a building carved into the rock itself. After Sonic and Chip have activated Temples of Gaia at Mazuri, Chun-nan, Spagonia, and Holoska, Professor Pickle decides to travel to his other lab in Shamar, where it transpires another Temple is located. 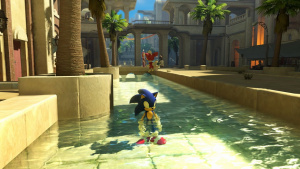 Pickle's relocation enables Sonic to access the desert region; and, in the Xbox 360 / PS3 versions, Empire City too, which shares the same planetary fragment. As with Spagonia and Holoska, the stages in Shamar and Empire City open up after each other; Shamar Day Act 1 opens Empire City Night Act 1. Going to talk to Pickle after this unlocks Empire City Day and Shamar Night, as well as Adabat. Collect both Gaia Keys and defeat the Dark Guardian to replenish the yellow Chaos Emerald and restore the planet fragment. Sonic and Chip in the town area. The daytime Entrance Stage in Shamar is where Sonic can find the Light Speed Dash Shoes, enabling him to use the Light Speed Dash and access Arid Sands Day Act 1. Ehsan (イフサーン)- One of the men helping to restore the ruins in Shamar. After years of walking in the sand and the dust, Ehsan can't seem to stop sneezing. Hizir (フズル)- An impatient fellow who's in such a rush to fix up the ruins that he's been known to wreck them even more just so he can get started on the job sooner. Raniya (ラニア)- A chatty lady who loves gossip like you wouldn't believe. Even on the most uneventful day, she and her friend Dinah can find some new morsel to talk each other ears. Iman (イマーン)- A famous Shamaran fortune-teller who knows much about the powers of the moon and local legends. Apparently even people from cold and distant lands catch wind of Iman's miraculous talents and decide to visit her. Utba (ウトパ)- One of the men helping to restore the ruins. Utba's incessant praying every night leaves him drowsy day after day. He's starting to wonder if you can't just pray in your sleep and still get credit for it. Mufid (ムフィード)- An ice cream vendor known for his winning smile and the gooey stretchy ice cream he serves. Having been raised on these elastic edibles, Mufid naturally believes all the world's ice cream is the same. Somebody needs to bring the man a cone from another country and serve him two scoops of reality. Erhan- (エルハン)- Hizir's son. He helps his father with the restoration of the ruins. Erhan walks like his father, talks like his father...They're two peas in a pod. About the only tellable differenceis his height, which he got from his mother. Labib- (ラビーブ)- A stubborn carpet-maker with years and years of experience. Labib snuck into the workshop and made his first carpet at the tender age of five, flooring the other carpet-makers at the time. His pet peeve: flamboyant youngsters. Sa'id- (サイイド)- A man who loves tea more than breakfast, lunch and dinner. Long ago, the girl he was dating asked, "Which do you love more, tea or me?" Sa'id looked at his sugar and didn't even blink before answering, "tea". Not long after, Sa'id was sugar-free. Latif- (ラティーフ)- Labib's younger brother, a klutz with his fingers who wasted out before he could ever become a carpet-maker. He's spacey, he's unreliable...And yet oddly enough, he handles the carpet workshop's accounts. Dimah- (ディナ)- Raniya's gossip partner. Dimah has been blabbing away for so long that she wound up missing her chance to meet a nice man. This would undoubtedly bother her if she weren't too busy gabbing to notice. Musaid- (ムサーイド)- A chatterbox who appointed himself the local tour guide. He's thorough, make no mistake: give him a chance, and Musaid will treat even the grungiest restroom like the Eighth wonder of the world. It takes him half a day just to show people around one block. Shadi- (シャーディ)- Labib's son, an aspiring singer whose deep, rich baritone causes all the ladies to melt. Sadly, Shadi's father disapproves of such shameless razzle-dazzle, and the two are constantly clashing. Sammar- (ファティマ)- Safi's directionally challedged older sister. Her sense of direction is so poor, in fact, that it's become almost legendary, with new and embarrassing chapters of the Sammar Saga being recorded on a daily basis. Layla- (ライラ)- A confident and fetching university student with an exotic flair. She is currently researching the ruins. Layla always dots her i's and crosses her t's, but the truth is, she is very much a clumsy oaf. and yet (oddly enough) many of her suitors cite this as a plus. Safi- (サファー)- Sammar's little brother, who has his hands full keeping his "directionally impaired" sister from wandering off a cliff. Safi insists that he's not clingy: he doesn't need his sister; SHE needs HIM. To the doubtery out there: this is 100% true. Sadiq- (スドゥキー)- An admirable lad who knows you can't cut corners if you want to fulfill your dreams. These days, Sadiq has been practicing to become a tour guide just like Musaid. Samia (ゼーナ)- A resilient girl: so young and yet through so much grief by her completely unreasonable older sister, Yasmine. Samia consoles herself with the knowledge that she will grow up to be a patient person. Yasmine (ヤスミン)- A spirited girl who protects Shamar along with her younger sister, Samia. She can't seem to decide on a name for her team. Currently it's the "Pretty Committee to Preserve Peace in Shamar". Last week it was "Darling Defenders of the Shamaran Sands," while the week before it was "Full Mettle Shamalchemists!" Someone really needs to take her comic books away. Hot Dog Vendor (ホットドッグ屋)- The manager of the "Don Fachio" hot dog mega-franchise's Shamar location. Always reliant on the kindness of strangers, he gives back to the community via his tantalizing turkey dogs made with twenty plus different herbs and spices. 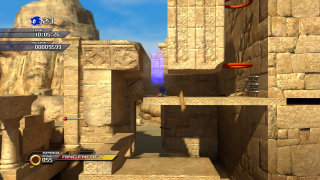 The main storyline Day act, this level sees Sonic race out of the town area and into the desert and gorges beyond. Falling temple pillars and wall running are just some of the hazards to avoid. A short stage full of Quick-Time Events, Sonic is propelled by springs onto rocky features around the canyon walls, and has to be quick with the button-pressing to avoid falling to his doom. This is a slow-paced block-pushing and fighting oriented level. The town squares in Shamar are swarming with foes, most annoyingly the Fire Masters. These can prove tricky for even a high-level Werehog to defeat as their flames do damage whenever you hit them, and this prevents the execution of high-power combos. Pick up water barrels to hurl at them and extinguish the fire, or alternatively just activate the Unleash power - which renders Sonic immune to their combo-breaking heat. There are several long boxed-in fight sections against the Masters; keep looking in side-rooms for health-replenishing rings or water barrels. Outside the town there's more block-pushing and Master-smashing action, but the more open environments generally make the combat in the second half of the level easier. This is the only area in the 360 / PS3 game where Dark Eels appear. Act 1 Night also contains a large chunk of level that was blocked off, likely to keep what already felt like a slow level short. This area can be seen in the Shamar Debut trailer and features several ruins in a canyon. However, the same video also shows the city having a different layout in terms of battles and one battle in the unused portion with two Titan enemies. Players can explore most of this area using a combination of physics abuse and glitching. As of 21 May, 2009, the level can be explored as Act 2. However, the monolith objects are not present in the DLC version. 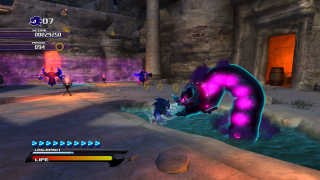 The fifth Sonic Unleashed downloadable content is the Apotos and Shamar Adventure Pack, serving as the first content pack to update two continents with new stages. Arid Sands gains one new daytime stages, two new nighttime stage, and a harder version of one daytime stage. It was released on Xbox Live for 250 MS Points on 21 May, 2009 and on the PlayStation Network for $3.00 on 04 June, 2009. Day Act 1-2 is a harder version of Act 1. Day Act 3 requires players to explore a fully 3D area to find ten chao. The general style of the stage is similar to a 3D Mario stage. Night Act 2 is the second, unused half of Act 1. Although it's a part of Act 1, it was dubbed its own act for whatever reason. Exploring the ruins in the canyons, this takes players through a few Titan fights before winding up outside of the arena for the Dark Guardian. An interesting thing about this act is Sonic Team blocked off the route to the collapsing pillar (makes sense, though, since you never cross over to act 1 at any time). However, this area can still be accessed if you go through walls to get into act 1's area. There are three things there: a row of vertical flamethrowers and two breakable chests. Obviously, Sonic Team had intended for you to reach it somehow. The odd thing is that the collapsing pillars are not there anymore. Night Act 3 is a large platforming area on some ruins requiring players to jump from poles over abysses. Titans are also present and are fought on small platforms. A hit from them can send a player into the abyss. These missions can be accessed by speaking with the hot dog vendor in Shamar after completing the corresponding Day or Night Act. Completing a level 1 mission unlocks the level 2 mission and earns 1 Turkey Dog, completing a level 2 mission unlocks the level 3 mission and earns 2 Turkey Dogs, completing a level 3 mission earns 3 Turkey and completing all of them will unlock the Kebab on a Bun Achievement. This page was last edited on 2 March 2018, at 12:39.